Suwanee, Ga. (May 6, 2014) – Alloy USA®, a manufacturer of performance drivetrain products, including gears and high-strength axle shafts, has announced the availability of a wide range of ring and pinion sets for Jeep® JK Wranglers (2007 – 2014). Available in 3.73, 4.10, 4.56, 4.88, 5.13 and 5.38 ratios, Alloy USA’s gear sets are made to last. Each set is constructed from high quality 8620 steel forgings and uses Gleason gear cutting technology for unsurpassed precision. Complete installation kits are available separately to complete the job. “From axle shafts, steering and suspension, and differential covers, Alloy USA really focuses on restored performance and increased efficiency,” said Henk Van Dongen, Director of Marketing at Omix-ADA. Alloy USA now offers affordable high strength gear sets in all the popular ratios to satisfy everyone’s gearing needs. Oversized tires require higher ring and pinion ratios to restore performance. 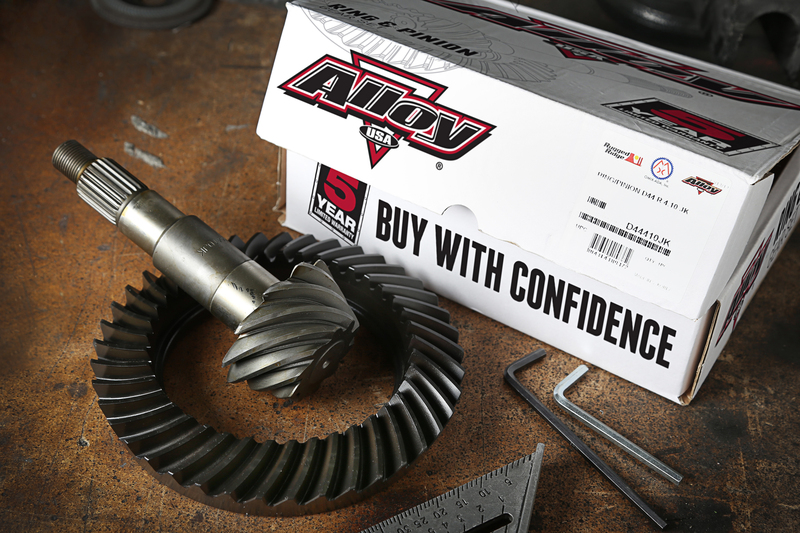 For more information about the JK ring and pinion sets, or Alloy USA’s complete line of performance drivetrain products, or to find an approved retailer, please contact Alloy USA at (770) 614-6101 or visit its website at www.alloyusa.com.